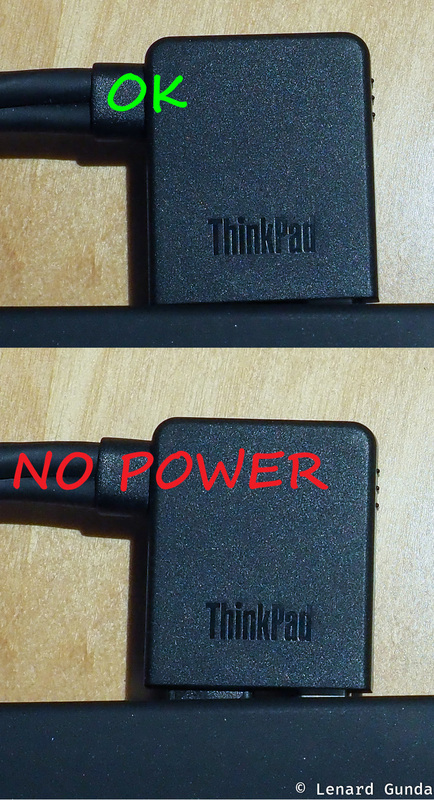 This article shows some common problems I have run into with the ThinkPad Thunderbolt 3 Workstation Dock. If you want to read about the dock itself, you will find a separate review about it here. 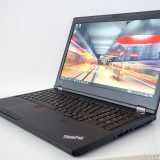 Some of these tips apply to other docks as well, but I write them from the perspective of the TB3 Workstation Dock and a ThinkPad mobile workstation (like the ThinkPad P52). Sometimes when you have connected to the dock, it will still not charge the notebook. This can happen when the connector is slightly turned to one side, and the power connector does not connect. It is very easy to cause. Sometimes the initial connection is not that good, then again sometimes moving the notebook slightly on the table can cause this. It is easy to fix, but equally easy to miss. 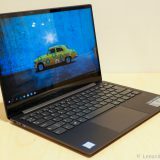 I have several times wondered, why my notebook is losing battery just to realize that there is no power connection. Sometimes the dock software will warn me that no power is connected, but the warnings are not consistent. The warning do not seem to appear if I hibernate the notebook and then wake up connected to the dock. The software sometimes produces false alarms if you have charging thresholds set in the computer. 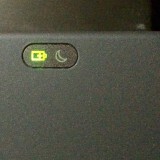 In this case, the lack of charging is intentional. Solution: Make sure the cable is always well connected. When connecting push the left side of the connector to make sure it is fully connected. 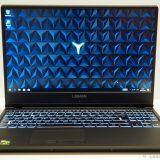 The dock software should check to see if a dock is connected EVERY TIME the computer is turned on, wakes up or starts up from hibernation. 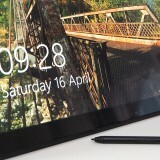 The docking cable’s end that connects to the computer could be designed to better align with the notebook. Slight indent on the notebook itself? Small light to indicate both TB3 and power connection (on the cable, not the notebook). 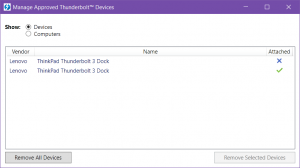 When you connect a Thunderbolt 3 dock for the first time to the computer, you must approve the TB3 connection to the dock. If the connection is not approved, the dock will not function. Devices connected to the dock will not be connected to the computer. I imagine this is some sort of security requirement, so that it would not be easy to connect complex devices into the computer. Often a popup will appear to approve the device. You can choose to approve this device forever, or just once. But this popup will not always appear. Solution: approve the device from the popup, or go and manage approved devices in the Thunderbolt 3 software to approve this device. I wish I could create custom aliases for the devices. Having the same dock at home and at work shows the same name for both. Sometimes peripherals will not be recognized by the dock. This means both displays and USB devices. 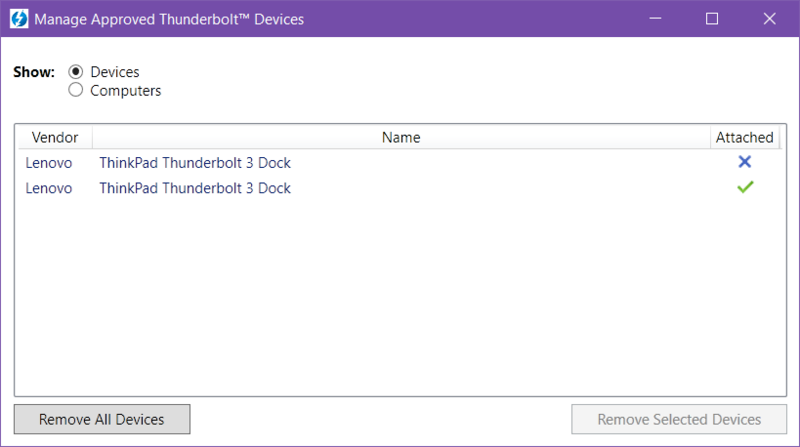 For USB devices, you can try to connect them to other USB ports on the dock, and still they fail to be recognized. This is different from the dock not being marked as approved. Solution #1: Reconnect the dock. 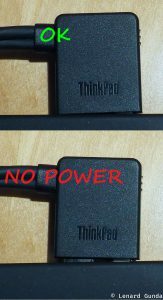 Remove the TB3 / docking cable, and connect it again. This solves the problems about 40% of the time. Solution #2: Power cycle the TB3 dock. Remove the 65W power connection from the dock itself, and then reconnect it. This usually solves the problem with a 90% chance. Solution #3: If neither of the previous steps worked, try rebooting your notebook. If you have problems with the dock, check for firmware and software updates regularly. 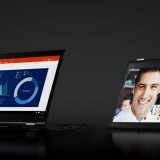 You can find them on the following page at the Lenovo support site. Note that the instructions do not tell you this, but after the dock firmware has been updated, reboot your computer and reboot the dock as well (by removing the power to the dock, and reinserting it). Otherwise, it will not function properly. Also, before you do this, some additional updates (like the audio firmware) will refuse to install. Lenovo Vantage will also want to update the Thunderbolt 3 software sometimes. It might be a good idea to NOT DO THIS together with a firmware update. Perform the firmware update of the dock separately, then reboot both your computer and the dock. Otherwise, you might end up in a situation where the Thunderbolt 3 software on the notebook might fail to install. 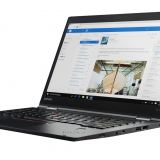 It fails silently (at least if you used Lenovo Vantage to install it), leaving you in a state that your dock just does not work. This is a confusing situation, because everything seems to be connected OK, and yet, nothing works, and there are no error prompts or anything. Solution: Reinstall Thunderbolt 3 software. 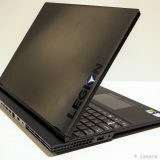 If installation failed, Lenovo Vantage will offer up installation again. Try again, and make sure to check in the installation history that the install went ok. 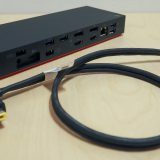 Thank you for sharing useful tips about P52 and the ThinkPad Thunderbolt 3 Workstation Dock. May I suggest to update the post and add some info cf. 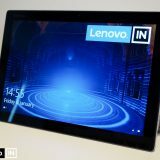 this post: https://forums.lenovo.com/t5/Displays-Options-and-Accessories/Thinkpad-Thunderbolt-3-Dock-Bricked-after-FW-Update/td-p/4348760/highlight/false. I.e. the users should refrain from applying the proposed update; otherwise => dock bricks. I’m very fond of the ThinkPad series. Unfortunately my opinion is that in the last years there are far too many issues with it. Temp throttling lottery, BIOS update lottery, Dock bricked. 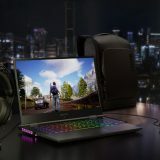 Even your recent post with the CPU freq lock and PC slowdown. I wouldn’t have minded if my PC would have “just worked”, without the need to peruse forums, repaste, undervolt, and other hacks. I’m not unhappy with my P52, but the amount of time I invested in such “tweaks” is big. Maybe in 1 or 2 years it will be compensated by the fact that the daily tasks run now a bit better (e.g. 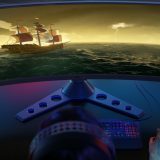 compile, build and other dev related stuff).